Our journey started with a drive to Chicago. We were flying out of O’Hare through Miami to St Kitts. Our first stop was at our parking location at the Loews Hotel O’Hare. We were actually staying at the Hilton O’Hare because of a great rate and for the convenience of being connected to the terminal. After a rather lengthy check-in process, we were finally in the room. The room was completely standard and had great views of the runway. I took advantage of the fitness center at the hotel which was fantastic with a ton of both cardio and weight training equipment. I believe you can buy a day pass and you get access to the pool as well. It would be a good way to kill a long layover. We had a very early flight so we could not get breakfast at the hotel. Instead, we went to the H/K Admirals Club at O’Hare using my Citi Prestige card. The lounge was in the process of being renovated and adding a flagship lounge. As a result, the bar and food area had received a facelift, but the rest of the club had not and was partially under construction. The food was standard club fare. After an uneventful flight, we visited the newly renovated Admirals Club by gate D15 in Miami. I had not seen what the lounge looked like before, so I cannot comment whether it was an improvement or not. However, I thought it was completely functional. It was divided into a couple areas. There were also showers available. The food was basically the same as in O’Hare as they were still serving breakfast by the time we arrived. Arrival into St. Kitts was painless and we debarked by airstairs onto the tarmac which is always fun. Immigration took about 30 minutes because we ended up at the back of the line. It did not matter in the end as people were just getting their checked bags and loading into the shuttles. The Four Seasons had an agent waiting in the baggage claim area to direct people to the shuttle location. Our bags were taken and told they would be delivered to the room. We then hopped into a shuttle for a 15 minute drive on a winding road to the harbor. The next step was boarding a boat for the journey over to the island of Nevis. The journey took about 15 minutes. The rum punches were free-flowing and always kept filled during the boat ride. It was a wonderful welcome to the resort. 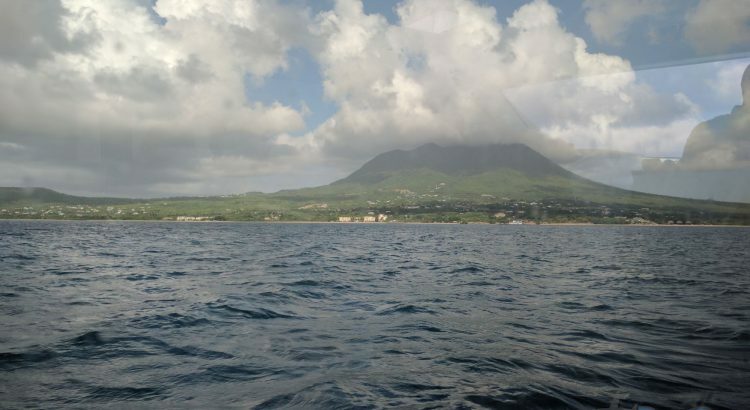 The entire transfer process was one of the smoothest I have experienced which was all the more impressive with the multiple steps it takes to get to Nevis.